It is greatly fit to any evening coctail party or masquerade ball. The skirt is made of very qualitative material. Patterns of butterflies make this skirt more positive, when you see it you wanna smile you wanna fly as butterfly. Life becomes more energetic, more sunny. We were inspired by designer lily young when created this skirt. Skirts and dresses is our passion. We attentively care about the quality of sewing process. When starting making our skirts we faced a problem of less expensive fabrics. After some time such cloth loses its color and a skirt becomes less attractive than it was. You may find it weird but it is highly recommended to wash a dress before you start using that because of chemicals that it might have. 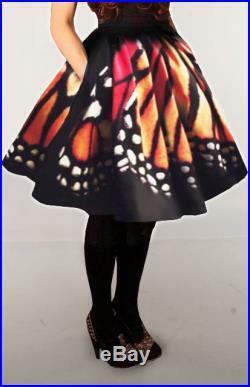 Dry clean onlystyle: designer inspired, evening, great for any occasiondesign: couture, butterfly "monarch"materials: "wet" silk, polyester. Sizes(length):60 cm (height 165 cm), 65 cm (height 175 cm), 70 cm (height 180+ cm).